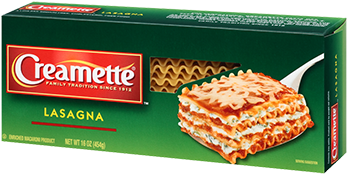 Lasagna are ripple-edged strips about 2-1/4-inches wide and 10-inches long. Almost exclusively used to make oven-baked entrées. Pasta is undercooked, then layered with tomato or cream sauces, cheese, meat (or seafood) or vegetables, then oven baked until pasta is done. Lasagna can also be cooked longer to make roll-ups; individual pieces are spread with cheese filling, rolled up, covered with sauce and oven baked. CONTAINS: WHEAT. MANUFACTURED IN A FACILITY THAT USES EGGS.